First, each player chooses one of the available clans to play, by placing one of the Clan Sheets in front of them. At the start of the game, all clans are equal, but they'll soon become unique with each player's choice of upgrades. Take your clan's Leader figure and 8 Warrior figures, and make sure the small plastic bases in your clan's color are attached to them. This helps easily distinguish your units on the board. Take one Ship figure and make sure it's got a sail attached in your clan's color. Keep all of your figures near your clan sheet. This area is called your reserve. Also keep your clan's extra 2 small bases and 2 large bases next to you. They will be used if you recruit any Monsters. Take you clan's Glory Marker and place it on the Glory Track around the board, on the "0" spot. Take all of your Clan Tokens, placing one of them on the first spot of each of the three Clan Stats on your clan sheet: Rage, Axes, and Horns. This means all players start the game with the following stats: 6 Rage, 3 Axes, and 4 Horns. Finally take your last Clan token and place it on the Rage Track on your clan sheet. 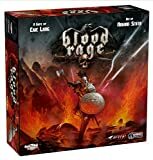 Since your starting Rage stat is 6, the token is placed on the "6" spot of your Rage Track. 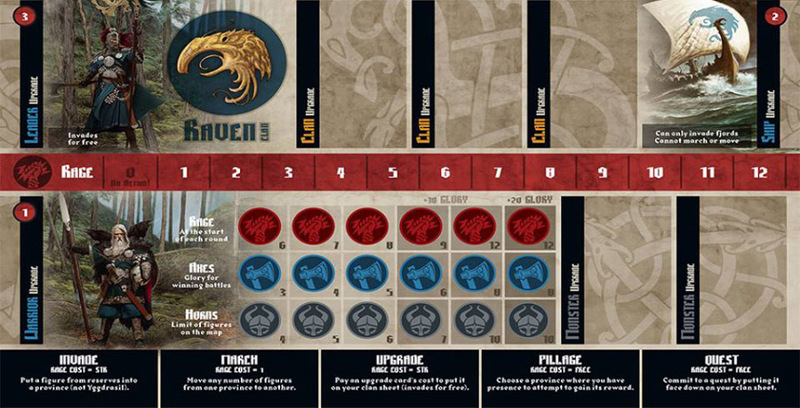 Next to the Game Board, place the Valhalla sheet and the Age Track sheet. Take all the Pillage tokens and place the one with the green border on the Yggdrasil province at the center of the board, with the reward side facing up. 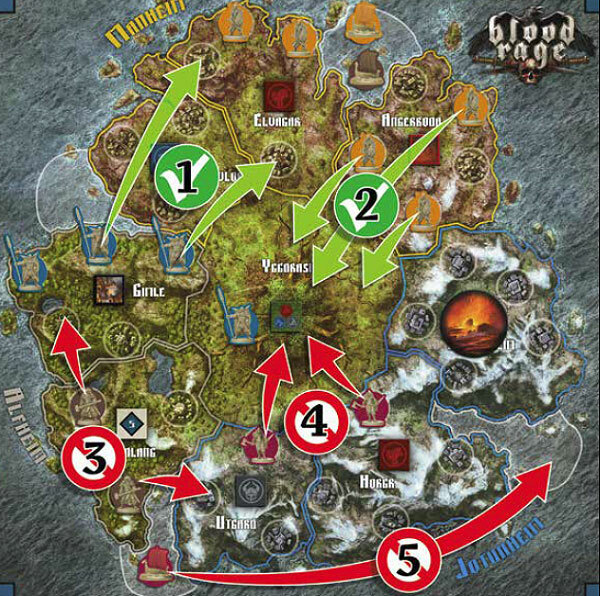 Shuffle the other 8 Pillage tokens and place them randomly on the other 8 provinces surrounding Yggdrasil, face up. The Pillage tokens show the reward you get for pillaging that province. Take the 8 Ragnarök tokens and shuffle them. Place one on each of the three Ragnarök spots on the Age Track. 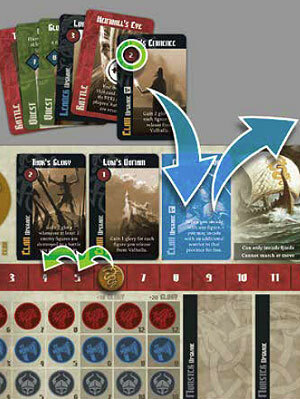 The tokens should have the text side facing up, indicating what provinces will be destroyed through the course of the game. 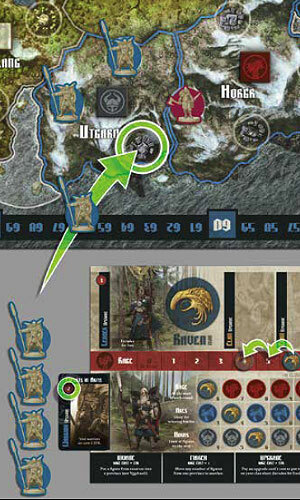 As a constant reminder of what is the province doomed to be swallowed next by Ragnarök, place the Doom token on the province indicated by the Ragnarök token on the First Age track. Before the game begins, some provinces will already have been destroyed by Ragnarök, leaving less usable space on the board. 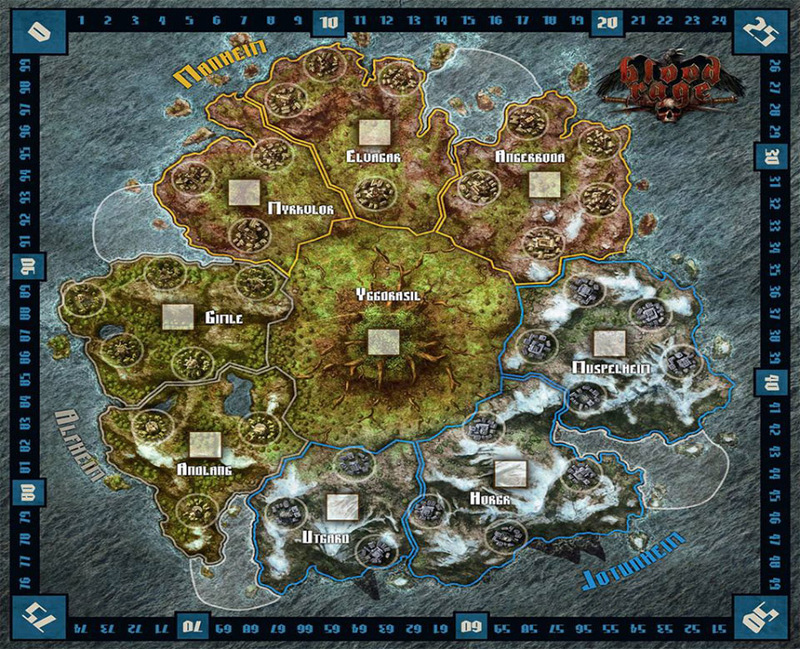 Depending on the number of players in the game, randomly take the number of Ragnarök tokens indicated below and place them on the provinces indicated on them, with the "destroyed" side facing up. On a 4-player game, 1 province is destroyed. On a 3-player game, 2 provinces are destroyed. On a 2-player game, 3 provinces are destroyed. 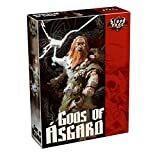 The remaining Ragnarök tokens are placed back in the box. A province with a Ragnarök token on it is effectively out of the game. No figures can ever be placed in that province. Separate the cards by their card backs, creating three different decks: 1, 2, and 3. Depending on how many people are playing the game, some cards may need to be removed from each deck to make sure the game is balanced properly. The cards that may need to be removed show on the left side a small number, such as 3+, or 4+. 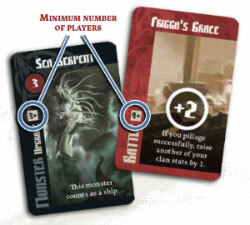 This indicates that the card should only be included when playing with the indicated number of players or more. For a 4-player game, no cards are removed. For a 3-player game, all 4+ cards are removed. For a 2-player game, all 3+ and 4+ cards are removed. Each decks contains eight 4+ cards and six 3+ cards. Any removed cards are placed back in the game box. Then, shuffle each of the three decks separately and place them, face down, on the appropriate Gods' Gifts spots of the Age Track. Place all Monster figures next to the board, within reach of all players. Place the Saga token on the first spot of the First Age on the Story Track. This is the "Gods' Gifts - Age 1" spot. The Saga token will be moved from phase to phase of each Age, one Age after the other, in order to help players keep track as the game progresses. Finally, give the First Player token to the player who was born furthest to the north. That player will start the game in the First Age. The First Player token will be passed to the player to the left at the end of each Age. The goal of the game is to achieve the greatest amount of glory before the world finally comes to its fiery end. You gain glory through victory in battle, through pillaging, accomplishing quests for the gods, and dying valiantly in battle. The game progresses through three Ages, as Ragnarök slowly consumes the world. The player with the most glory at the end is the winner. The phases must be played in order, and a phase must be completely finished before moving to the next one. Move the Saga token on the Age Track from one phase to the next as they are completed, to help keep track. 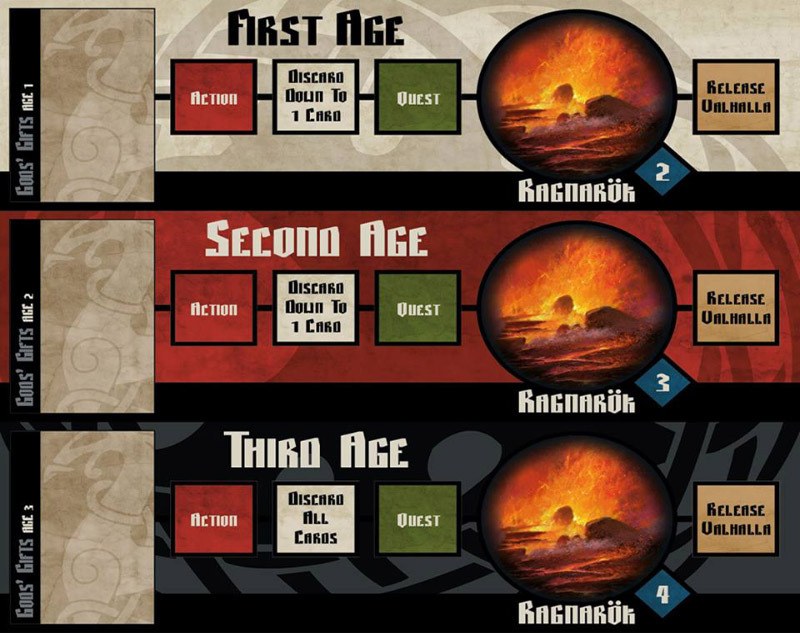 Once the last phase of an Age is done, the Saga token is moved to the first phase of the next Age, until it reaches the end of the Third Age and the game ends. During this phase, players draft (select) cards. These cards will provide them with upgrades for troops and clan, monsters to join the fight, quests for glory, and the raw power to win battles. On the Second and Third Age, if a player has a leftover card in their hand from a previous Age, they must first place this card face down on their clan sheet, on top of their clan symbol. Take the deck of cards from the Age Track relative to the current Age and deal 8 cards to each player. There will always be two cards left over after that (four in a 2-player game). Discard these cards, without looking at them. Drafting works like this: Each player inspects the eight cards dealt to them and selects one to keep, placing it face down on their clan sheet, on top of the symbol of their clan animal. Once everyone has placed a card on their clan sheet, everyone passes the rest of their cards to the player on their left. Now each player looks at the cards they've been passed, selects one to keep, and places it face down on their clan sheet. Then everyone passes their remaining cards to the left. Continue picking and passing cards until each player has placed six new cards on their clan sheet. By that point, everyone will have two cards left to pass. But instead of passing them, they must be discarded without showing them. At the end of this phase, all players should have 6 cards in their hand, plus any card they might have saved from a previous Age. Keep these cards secret from the other players. You will be able to use these cards during the Action phase. This is the main part of the game, where invading and pillaging takes place, battles are fought, and blood is spilled. All players begin the Action phase with the amount of Rage indicated by the Rage stat on their clan sheet. If this is the first Age, you've already taken care of this by placing your Clan token at 6 Rage during setup. 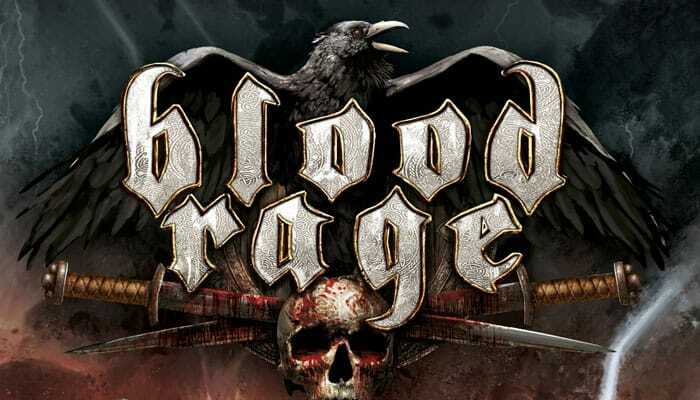 In subsequent Ages, if you have improved your clan's Rage stat, you will begin the Action phase with more Rage. Example: The Raven player has improved his Rage stat two steps during the previous Age, so he begins the next Action phase with 8 Rage. The player with the First Player token will go first, and play proceeds in clockwise order from there. On your turn, you must choose a single action to perform. If that action carries a cost in Rage (it usually does), you must pay that cost and then take your action. Move the token on you clan's Rage Track to indicate how much Rage you've spent. If you do not have enough Rage to fully pay for a particular action, you cannot take that action. Once your action is complete, your turn ends. The player to your left will then take their turn, performing a single action and paying any Rage cost associated with it. Players continue taking turns in order. A player that is down to zero Rage cannot perform any action on their turn, not even an action that costs zero Rage. All that player can do is react to other player's actions, such as participating in a battle started by another player. Players have five options to choose from when performing an action (as indicated at the bottom of the clan sheet). Players can take the same action several times throughout an Action phase, always taking a single action per turn. If you cannot take an action, or do not wish to, you can choose to pass. However, when you pass, you lose all your remaining Rage and can take no further actions. End of the Action Phase: The Action phase immediately ends when either all players are down to zero Rage, or all of the provinces that are not yet destroyed have been successfully pillaged (even if players still have Rage left). Choose a single figure in your reserve and pay Rage equal to that figure's STR. Take that figure from your reserve and place it into any empty village in any outer province. If the chosen figure is a Ship, it must be placed in any fjord. You cannot use this action to place a figure directly in Yggdrasil; to put your troops in Yggdrasil you'll have to March them there. Also note that invading with your Leader does not cost any Rage. Example: The Raven player has upgraded his Warriors. Since their STR is now 2, he pays 2 Rage in order to Invade the empty Utgard village with 1 of the Warriors in his reserve. Note: Always pay attention to your Horns stat. If the number of your figures on the board is equal to your current Horns stat, you cannot Invade with any more figures (Valhalla is not part of the board). When you order your troops to March, you must pay 1 Rage. Choose one province (you cannot choose a fjord) and move any number of your figures from that province to empty villages in another single province. The destination province doesn't have to be adjacent, it can be anywhere on the board. You cannot move figures from two different provinces in the same action, nor move your figures to two different provinces. You can only March from any one province to any other. Note: Using the March action is generally the only way to get your figures to Yggdrasil. There are no villages in Yggdrasil, so there is no limit to the number of figures you can have there. The blue player can move his 2 figures, even though the provinces are not adjacent. He's unable to move all 3 of his figures from Gimle because Elvagar only has 2 empty villages. The yellow player can move all the figures he wants from Angerboda to Yggdrasil. There's no limit to the number of figures that can occupy Yggdrasil. The brown player cannot move his figures into two different provinces with a single March action. The red player cannot move his figures from two different provinces with a single March action. Ships can never be moved. Each clan sheet has slots for up to eight upgrades: one each for your Warriors, Leader and Ship, two for Monsters, and three for your Clan. When you Upgrade, you must choose an Upgrade card from your hand and pay Rage equal to that card's STR. 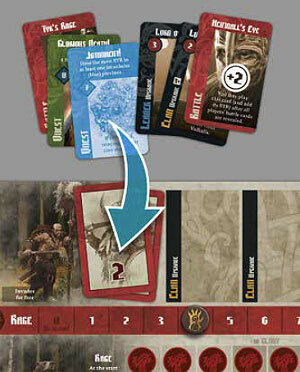 Then place the card in the appropriate slot on your clan sheet. If there is more than one potential slot, you choose which one to use. If there is already a card in that slot, discard the old card and replace it with the new one. This new Upgrade card is now in permanent effect, granting you any benefits listed on it; from higher Strength for your troops to special abilities. If your clan has two Upgrades in different slots that give you the same type of benefit, both cards take effect independently. One does not cancel the other. When you play a Leader, Warrior, or Ship upgrade, if you have the corresponding figure in your reserve, you may immediately (before the next player's turn) Invade with it without spending any extra Rage. Monsters are unique figures that can dramatically change the course of the game. Each has a powerful and unique special ability. When you play a Monster upgrade, take the corresponding Monster figure, attach your clan's base to it and place it in your reserve. It is now yours for the rest of the game, counting as one of your figures. You may immediately Invade with it without spending any extra Rage. Your Monster can die and be sent to Valhalla like any other figure, returning to your reserve in the next Release Valhalla phase. It can gain Glory for you during the Ragnarök phase just like any other figure. You can only have 2 Monsters as part of your clan at a time. If you discard a Monster's card in order to place a new Monster in its Upgrade slot, the old Monster figure is immediately returned to the game box. Take a Quest card from your hand and commit to it by placing it face down on your clan sheet, on top of your clan's animal symbol. It costs no Rage to commit to a Quest. There is no limit to the number of Quests you can commit to during each Age, and you may commit to two Quests of the same type (each giving its reward independently). You may inspect your own Quests at any time. During this Action phase, you should try to fulfill the demands of the Quests you commit to, reaping the rewards listed on them during the next Quest phase. However, there's no penalty for failing a Quest. Note: Even though it costs no Rage to commit to a Quest, remember that you cannot take any actions if you're down to zero Rage; not even a free one. If you can successfully Pillage a province, you will gain a reward, either by improving one of your clan stats, or by gaining more glory. But first you will need to defeat in battle any other clans occupying that province. Call to Battle: Players may move adjacent figures to join the battle. Play Cards: Players in the battle reveal cards to add STR and/or special effects. Resolution: Highest STR determines the winner. Losers are destroyed, winner gets rewards. Once you have declared your intent to Pillage that province, the other players have a chance to join the battle. Starting with the player to your left and going around in clockwise order, each player (including you) may, if they wish, move one of their figures from an adjacent province into an empty village in the province you are pillaging. Moving a figure in this way does not cost Rage (and note that Ships cannot be moved). Once all villages in that province are occupied, or when no one else wishes to join in, the battle begins. Note: There are no villages in Yggdrasil, so any number of figures can join a battle there. If at this point there are no enemy figures in the province or its supporting fjord, no battle takes place and you automatically Pillage the province, gaining its reward and flipping its Pillage token to its "pillaged" side. Note that in this case you don't gain any Glory for winning battles. Otherwise, a battle will take place, and all figures in the province being pillaged, or its supporting fjord, must participate in it. 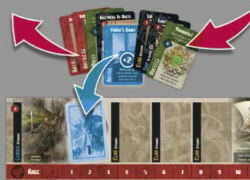 Each player participating in the battle must choose one card from their hand and hold it face down in front of them (unless they have no cards left in their hand; in that case they don't have to put a card in). Then they all reveal their chosen card simultaneously. If you reveal a Battle card, its +STR bonus will be added to the total STR of your figures in the battle. Also, any special abilities listed on the card takes effect at this point. If, however, you reveal an Upgrade or Quest card, it adds nothing to your Strength in battle and has no effect. Each clan adds together the STR of each of its involved figures, and adds the +STR bonus offered by their played Battle card (if any). This is their clan's total STR in that battle. Note: If a card's special effect causes a player to lose all the figures he had in the battle before comparing STR, that does not mean that clan is out of the battle. The figures were destroyed in the course of battle, and the clan might still emerge victorious if its played Battle card has STR enough. The player with the highest STR total wins the battle! In case of a tie, all participating players lose the battle. The winner of the battle (if any) must discard all cards he played. The losers of the battle take all of their played cards back into their hands. All losing players must destroy all of their figures that were in the battle (including those that were supporting from fjords), placing them on the Valhalla sheet. If the player who initiated the Pillage wins the battle, they pillage the province and gain the reward indicated in the Pillage token (see below). 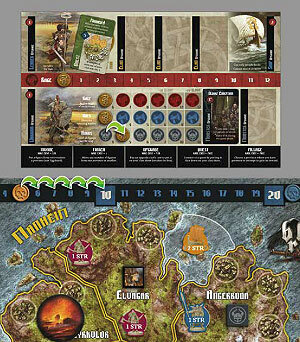 Flip the token to its "pillaged" side to indicate that the province cannot be pillaged again until the next Age. If the pillager does not win the battle, the province is not pillaged and nobody gets the pillage reward. Any player (including the pillager) can try again later in the phase to pillage the province. Finally, the winner of the battle gains Glory, whether he's the pillaging player or not. The number of Glory points they get is equal to their current Axes stat, as indicated on their clan sheet. When you successfully Pillage this province, increase your clan's Rage stat one step. You do not gain additional Rage during this phase, but you will start with more on the next Age. When you successfully Pillage this province, increase your clan's Axes stat one step. The increased Glory for victory in battle takes effect immediately and includes this battle. When you successfully Pillage this province, increase your clan's Horns stat one step. When you successfully Pillage this province, gain 5 Glory. When you successfully Pillage Yggdrasil, increase all three of your clan stats one step. All players must discard any cards that may still remain in their hands. They can only keep a single card to use on the next Age (if they have any). Each player reveals all Quests they have committed to. If you have met a Quest's demands, you gain the amount of Glory indicated on the card, and may also raise any one of your clan stats one step. If you fail to fulfill a Quest, you get nothing, but you also lose nothing. Discard all revealed Quests, whether successful or not. Most Quests involve having the most Strength in a given province. Add together the STR of each of your figures in that province (including the supporting fjord) and compare your total to the total STR of each other clan in that same province. If your total is greater, you fulfill the Quest. If you tie with an enemy, you fail the Quest. However, her STR 2 Ship is also supporting Angerboda, where the blue player has only a STR 1 Warrior. With this the Quest succeeds and the Serpent clan gets the 5 Glory listed on the Quest cards and the player decides to raise her Horns stat one step. Take the token that's on the current Ragnarök slot and place it on its corresponding province, with the "destroyed" side facing up. That province is destroyed forever and is out of the game. There can be no more glorious death to a Viking than to be destroyed in Ragnarök. When a province is destroyed this way, all figures in that province, and in its supporting fjord, die and are placed in Valhalla. Each such figure earns its clan some Glory. 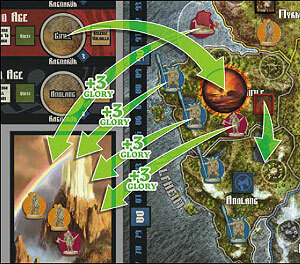 The amount of Glory granted is indicated on each Ragnarök slot on the Age Track. 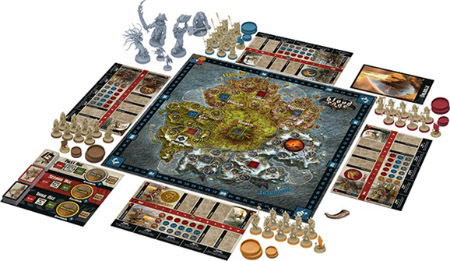 For each of their figures (including Monsters) destroyed in Ragnarök, the players gain 2 Glory on the First Age, 3 Glory on the Second Age, and 4 Glory on the Third Age. Next, place the Doom token on the province indicated by the next Age's Ragnarök token. At the end of each Age, players receive one final gift from the gods: all figures in Valhalla are returned to their respective owners. Move all figures on the Valhalla sheet belonging to your clan back to your reserve. Any figures on the game board remain there. Before moving on to the next Age, flip all Pillage tokens on the board back to their "reward" side. These tokens are not reshuffled; they stay on the same province throughout the game. The First Player token is passed to the player to the left. Then, move the Saga token down to the first phase of the next Age on the Age Track. A new Age will then begin with a new set of Gods' Gifts. With each new Age, those gifts will grow in strength and power, offering greater glory, and leading to greater clashes on the board over less and less remaining territory as Ragnarök continues to destroy the land. Once the Release Valhalla phase of the Third Age is completed, the world has come to an end, and so has the game. It is now time to see what clan has gained the most glory and earned its place in Valhalla next to Odin's throne! There is one last bonus to tally, though. Players gain a Glory bonus for increasing each of their clan's stats to legendary levels. At the end of the game only, for each of your clan stats that has been increased to the 4th or 5th step, gain +10 Glory. For each of your clan stats that has been increased to the last step, gain +20 Glory. Example: The Raven player has managed to raise a couple of his clan stats to legendary levels. At the end of the game he gains +10 Glory for Rage and +20 Glory for Axes, for a total of +30 Glory. The player whose clan has the most Glory is then declared the winner.